Just a "heads up" to anyone who might want to stop in over the weekend. I'll be CLOSED on Friday and Saturday due to Bridal Show season. I'll be participating in a Business Open House on Friday at The Galleria in Celina. Deb, the boss lady in charge over there is cooking up a fabulous batch of samples for local businesses. These folks will be touring the facility in order to get ideas churning for company parties, meetings and whatever else people need. 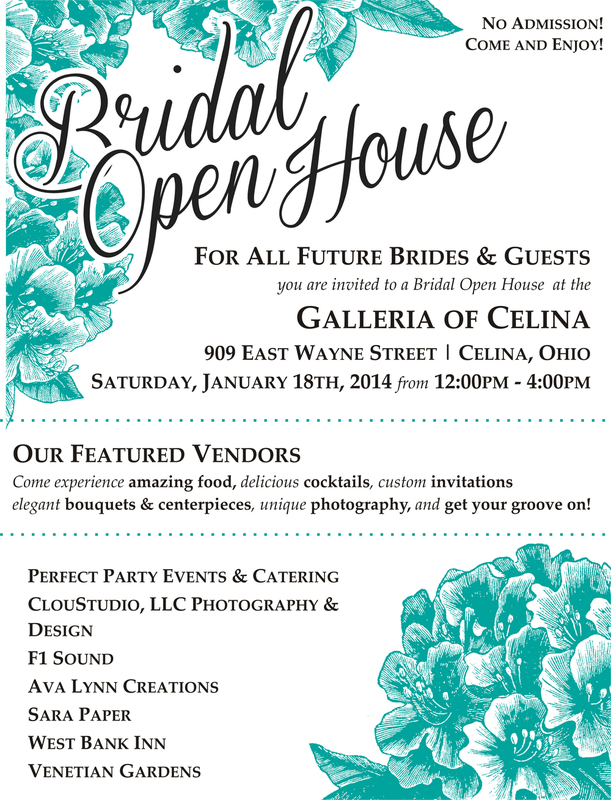 The vendors will be keeping their booths up and we're inviting the public to come on Saturday for a Bridal Open House. This is a FREE event and sure to be worthwhile to prospective brides and grooms. The Galleria is a really nice facility and the folks there are passionate about serving their customers and making events special. I know Deb from Perfect Party Catering is always looking for recipes, design ideas and she has her chef work up Vegan and Gluten Free dining options. I'm personally looking forward to making some new connections with potential clients (not to mention trying out a Bavarian Ham Skewer and sampling the Chesapeake Citrus Tilapia).